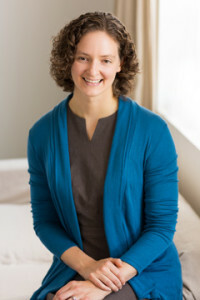 Alison Cardy '02 (who was known as Alison Horner before marrying Dan Cardy '01) is the founder and CEO of Cardy Career Coaching, a team of career coaches who specialize in helping their clients through career changes. She recently published a book, Career Grease: How to Get Unstuck and Pivot Your Career, and she spoke with Ted Jou '99 about her own career and shared advice for other Magnet alumni. How did you become a career coach? What did your career path look like after high school? After Blair, I went to Maryland and got a degree in accounting. The first couple years of my career, I worked as an accountant, and the whole time I had a strong sense that it wasn't quite right for me. I did fine at it but I didn't really enjoy it . . . During those early years, I spent an inordinate amount of time worried and wondering, "What am I going to do? What would be better?" Eventually, I hit on that I really like counseling-type things, and I started exploring that path. One of the most helpful experiences that I did was that I volunteered at a crisis and suicide hotline, which sounds very dark and depressing, but it was really helpful for me because I received phenomenal training and I got to be on the helping end of a conversation, which I really enjoyed. So I loved being there for people and being helpful. And from there I went on to get coach training -- and a bit naively, I jumped into opening my own business. When was that, and why do say you did it naively? I started my business a bit over seven years ago, and I was very strong on the helping skills, but I had a really steep learning curve on running a business, and particularly the back end of it in terms of marketing and just letting enough people know that you exist. What does your business do? What does the coaching involve? At the moment I run a career coaching team. We focus on helping people through career changes, and because I went through that process myself, I can really relate to what our clients are going through and what their struggles are. There are a number of places people can get stuck - right at the beginning when they are trying to figure things out - and we specialize in moving people through that process so that they can improve their career and have it more aligned with what they're wanting. That could be they're wanting more financial security, more work-life balance, or more fulfillment from their work, and we really try to tailor whatever help we provide to whatever the individual is looking for. Most people we work with are dissatisfied in some way with the career path that they're on. We work with people at all stages of life and across industries, so we have a really broad client base, but they are all facing a very human problem of wanting to make a change and feeling stuck with it. A lot of times they will have been thinking about it for a year, or maybe a couple years or even a decade, and not making progress on the change that they're wanting. The first piece that we help folks with is overall clarity - to more specifically identify and catalog the elements of the career that they're wanting. From there we help them to match the overall idea of what they want to specific jobs. We guide them through career exploration, and then we help them to make an action plan: short-term and long-term goals to make the transition. That's the process on a high level, but on a case-by-case basis there are a lot of psychological elements that go into making a change, particularly in a career change where it affects so many areas of your life, it is really easy to get tripped up in the process. So all along the way we help deal with things like fear, doubt, or places where people are just over-thinking things or getting in their own way. Maybe their social environment isn't supportive - we help with all those things to really help people make progress and get unstuck. You mentioned "career exploration." What is that? Career exploration is getting out into the world, talking to people who are doing what you want to be doing so you can learn more about it and also build new connections with people that can potentially be a bridge for you to get into that new field. It is something that a lot of people don't understand. A lot of times people want to make a change and they jump straight to job searching - particularly I see a lot of people jump straight to online job searching where you are looking at online job listings and just shooting out applications into the great abyss. Career exploration is quite different - it is going in with a hypothesis: "I think I want to do X." And then going out into the real world, talking to people, attending events that relate to what you want to be doing, potentially doing volunteer or freelance work on the side - anything that moves you closer to that profession in kind of a low-risk way. You don't have to put down a whole chunk of change for graduate school or apply for a job tomorrow - it's kind of testing the waters and getting feedback from live people on what this new thing is because you may not be totally familiar with it. In the process of doing that there is the wonderful byproduct that you start to build your network into that new career path that you're considering. You've written a book. What is it about? 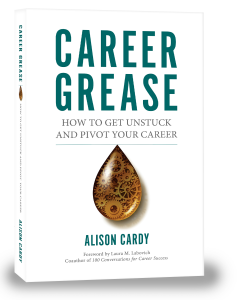 The book is called Career Grease: How to Get Unstuck and Pivot Your Career. It is an A-Z of the process we take our clients through, so it is subject matter that I knew really well. I wrote it from a place where I wanted to be as helpful as possible to share my knowledge. I have been doing this about seven years and I have had hundreds of conversations with people, so I know the landscape like the back of my hand; I wanted to break that down for people so that they would be able to maneuver through a career change and just understand all the moving pieces and what to look out for because there are a lot of pitfalls where they can get stuck. Every chapter has a story - names and identifying details have been changed of course to protect confidentiality - but they are all client stories in every chapter. It is a mix of stories to illustrate the point and what step in the process someone is at and what they need to do. There are exercises in every chapter, I bust some career myths, and I have coaching notes. What general advice would you have for Magnet alumni reading this story who may be thinking about a career change? Not to be a broken record, but the biggest piece of advice that I say is to give yourself some time and space to explore and talk to people. I often think of a metaphor that a client shared with me. He said that when he was a kid, he was at his grandmother’s house, and she had him stand at the front door of the house, she turned out all the lights and gave him a flashlight. She told him to walk from the front of the house to the back of the house. He looked in front of him, dodged tables and a doorway, and made it to the back of the house. She asked him, "How did you do that when you couldn't see where you were trying to get to at the beginning?" He said, "I just took the next step that I could see." I think that metaphor is so apt for a career change. We don't always know what we want when we first start out, but it's really important to take the next step that you see - maybe you notice that you're interested in politics or in urban planning or marketing, so just move a little closer to it, and when you do that you'll be able to see farther. You'll be able to notice - I thought this was going to be one way, but this isn't quite right. You'll be able to readjust or you'll learn of another opportunity or a specific type of work in that field that you would never have known about if you had just stayed in the same place. What do you remember from the Magnet? Is there anything from the Magnet that had an influence on what you are doing now? I really loved my experience in the Magnet and a lot of my clientele matches up with the type of people that I went to school with, so I really appreciate knowing that language and knowing that type of person. I don't know if i have a specific experience that I remember having a major impact, but I think of the overall caliber of the teachers that I had who took the subject matters in the Magnet and made them so accessible and clear. With clients that I work with, so many people tell me, “I hate math,” but I tell them, “What, how is that possible? I love math. Math is great!” And I think it's really a testament to the wonderful teachers that we had who made it a great experience for us. As I look back, I am increasingly grateful for that training in logical thinking and structure. I really see in the world that I'm in now that a lot of people struggling with this - for example, as the business grows you create more and more systems, and you need to think about things in terms of algorithms: first this happens and then the next thing happens. That came very naturally to me, and I think that is because of my training in the Magnet and that way of thinking - a systematic and structured way a thinking. I see a lot of other people - because this work is very emotional and right-brained - people who are drawn to this work don't necessarily have that background. And I'm actually really grateful for it. You are currently doing events promoting your book. How can people come see you and learn more about what you do? In conjunction with my book, which launched in March, I have been doing book launch speeches. I have had three book launch events in the DC area, and my team and I are working on a national speaking tour in the fall. The best way to find out if I'll be in your city would be just to poke around on my website: http://www.cardycareercoaching.com. We'll be doing some virtual events too that people can call into.